Did you know that the AMC Pacer was originally designed around a GM engine? The mill in today's Nice Price or Crack Pipe Pacer wagon is from the General, but not the Wankel originally envisioned. Could it's price however, be something you could see paying? Ground control to Major Tom. A lot of you described yesterday's plan-built and VW-based custom camper as the rolling embodiment of a Star Trek shuttlecraft. That just goes to show that many of you are still clinging to the glorious nerdom of your teenage years. Unfortunately, the Force wasn't with that van's present owner, and its 52% Crack Pipe loss means it won't be subbing for Lone Starr's Winnebago any time soon. Thankfully, in space, no one can hear you scream. Hey, hey, kids, it's Pacer time. The AMC Pacer was so bulbous a design that it looked like a Weight-Watchers before to the contemporary Porsche 928's after. The wagon edition of the Pacer, which was introduced in 1977, was an even more Rubenesque iteration, and this 1978 Pacer wagon is so generous in its hindquarters that it looks like it may have just rolled off a Sir Mix-A-Lot video shoot. 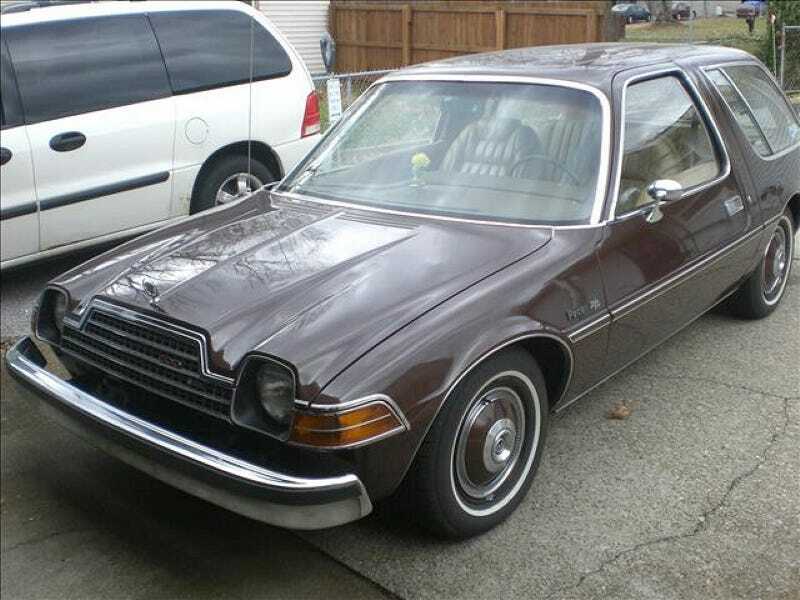 The Pacer of course was originally intended to carry a Wankel engine that GM was developing in the early '70s, and which AMC was rabidly coveting. Surprisingly for General Motors, the company realized that the rotary engine lacked certain attributes - things like reliability and fuel economy - that were increasingly becoming popular among the car buying public, so they dropped the development of the engine. I always imagined that they then moved the engineers over to work on the Olds diesel and Cadillac 8-6-4. The Pacer as released had to make due with the mills that AMC had at the time, which included a series of cast iron straight sixes and a later 5-litre V8. Being the seventies, none of those engines produced the sort of horsepower you could write home about. This one however has gone back to the General for its ponies (or more likely its torquies) as it rocks a massive 500-cid Cadillac v8. That's 8.2 liters and 535 ft-lbs (gross) at 2,800 rpm, which unless you're from Mars or something, is a hell of a lot. Backing that up all that twist is a BOP 3-speed operated through a studly Hurst ratchet. The installation of the Caddy engine looks to be pretty clean, with its twin intake snorkels routed reasonably well, and a pair of fans on the aftermarket radiator to keep things cool as Fonzie. Ladder bars on the back axle keep things in line, and aside from the cheeky Caddy hood ornament, there is no other indication that this Pacer is anything out of the ordinary. On the inside it does get a spate of additional gauges, the Pacer IP being limited to a rectangular speedo and a gas gauge. Other than those additions, it's like the seventies threw a party in there. On the outside, it's glorious brown and features full wheel covers that are likewise poo-hued. It's the ultimate Q-ship. Mileage is claimed to be 42,000, and the seller says he built the beast a decade ago so you can take comfort in knowing that it's not just someone's ill-conceived project. But is it worth $7,500? That's the question today and I want your vote one way or another. What do you think, is this Caddy-powered Pacer worth that kind of money? Or, does this 8-litre fishbowl come with a whale of a price? CarsforSale out of Louisville KY, or go here if the ad disappears.